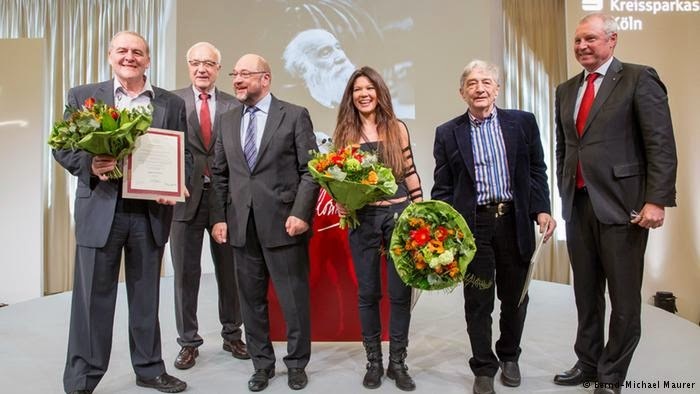 COLOGNE, Germany -- Two Russians and two Ukrainians have shared this year's Lev Kopelev Prize for peace and human rights. All of the artists contributed, in rather different ways, to combating nationalism and propaganda. 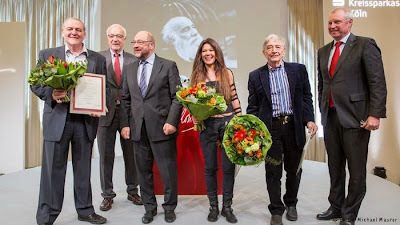 All four of the Lev Kopelev Prize winners - Ruslana Lyzhychko, Yevgeniy Zakharov, Andrei Makarevich and Eduard Uspensky - emulated the author after which the prize is named by fighting "for the tolerant co-existence of all nationalities, in Ukraine as in Europe." "That Russians and Ukrainians should fight a war against each other would have broken the heart of Lev Kopelev," the Cologne-based Lev Kopelev Forum said in a statement on its website on Sunday. "He was born in Kiev. A Russian of Jewish heritage, that's how he described himself. He had great respect for Ukraine and its own culture." Ukraine's 2004 Eurovision song contest winner Ruslana Lyzhychko was arguably the most renowned co-winner of the Lev Kopelev Prize - an award without a cash purse that's been handed out in Cologne since 2001. After her Eurovision glory, the daughter of a Russian mother and Ukrainian father stepped onto the political stage in 2013. During protests on the Maidan square in central Kiev, Lyzhychko's cry to police of, "don't shoot your own people!" became a renowned appeal. The foundation lauded Russian singer Andrei Makarevich for putting his "cult status" at home at risk by accusing Moscow of meddling in the Ukraine conflict. Since then, the Lev Kopelev Forum noted, Makarevich had stuck to his stance on Ukraine despite "being classed as a traitor in the media." Makarevich is a founder member, lead singer and guitarist for the Russian rock band "Maschina Vremeni" (Time Machine), formed in 1969. Children's author Eduard Uspensky was also singled out for his support to Ukraine from his Russian home. Uspensky has a strong following in both countries. Yevgeniy Zakharov also shared the prize; a Ukrainian of Russian heritage, he set up the "Memorial" human rights foundation in his hometown of Kharkiv. "He fights, undaunted, against corruption and for the rule of law," the foundation said. European Parliament President Martin Schulz was on hand in Cologne on Sunday to deliver the keynote speech honoring the four winners. Lev Kopelev was born in 1912 in Kiev, and died in Cologne in 1997. A student of German in his youth, he was a prominent advocate of reconciliation between Moscow and West Germany during the Cold War. He collaborated with German writer Heinrich Böll, and in 1980, cautiously agreed to travel to West Germany; Kopelev had feared that leaving the Soviet Union might turn into exile. In 1981, Kopelev's fears were realised and his exit-visa turned into Soviet exile - after a visit to the US, he and his wife settled instead in Cologne. Both his ashes and those of his wife, Raissa Orlova, were returned to Moscow after their deaths.